Frank Harrison, a Springdale man accused of stealing a team of horses, was shot dead by officers attempting to arrest him. Two Springdale constables went to his cabin and persuaded him to come out of his cabin. However, he ran into the brush when he realized they were trying to arrest him. One constable went around behind him and called on him to surrender. Harrison reached for a gun and one of the officers shot him in the leg. 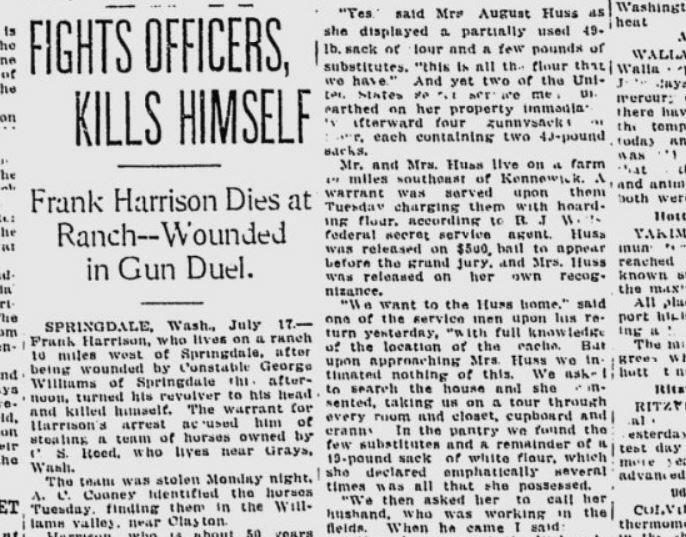 One of the constables said that Harrison then tried to shoot him, so he shot Harrison through the body. From the Irish beat: The Spokesman-Review editorial page called for the arrest of Kathleen O’Brennan of Ireland, who gave a speech the day before saying that she had no quarrel with Germany and that Great Britain was the enemy. “She should be in jail, and it is the duty of the federal authorities to arrest her and warn her disloyal sympathizers that jail cells await them if they give expression to like seditious or treasonable utterances,” said the editors.